My father was a lifeguard, before I was born, so maybe my love of the ocean is in my blood. As children we grew up in Brooklyn and would go to Riis Park for our day at the beach. One very distinct memory is of my father as he stood waist deep in the ocean with my brother and sister at his side; the waves periodically lifted and dropped them in the water. Waist deep for my father meant it was well over my head so I remained a safe distance (or so I thought) behind them. Suddenly, a wave appeared and before I could turn and rush to the shoreline the ocean attacked. I found myself in a world of foam, pockets of air allowed me to breathe as I was tossed like a wet sock in a dryer. Head over heels I tumbled, my legs and arms scrapped by the crushed sea shells that covered the shoreline. After what felt like an eternity I found myself on the wet sand as the wave retreated out to sea; I'm pretty sure it laughed and gave me the finger as it left. "Run back to your mother, wimp" the ocean said, "but one day I will get you." Jump ahead a few decades and I'm back at the beach, but now with my own kids in tow. It's a nice, quiet place on the Jersey Shore, Bradley Beach. Before we unload the car I told them how to act if they ever get caught in a riptide. "Don't try to struggle against it," I explained. 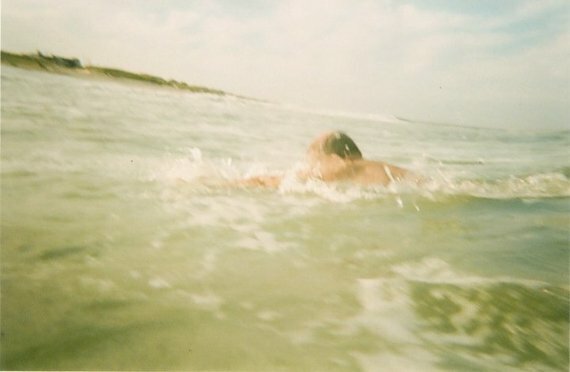 "Just swim parallel to the shoreline until you are free of it." The following week I was in L.B.I. (Long Beach Island for those of you not from Jersey) with the woman I dated at the time to visit some friends. The two of us spent the better part of the day in the water; the ocean was rough and tossed us around with ease; I loved it. After a few hours she decided to go back to our spot on the beach. I told her I'd be out in a minute; I wanted to catch one more wave. Just as she reached the shoreline everything changed. Finding myself in this position I did exactly what I told my kids not to do -- I swam for my life toward the beach. After a minute or so I accomplished nothing more than to increase my panic and decrease my strength. This was it; I knew I was going to die. Usually when people say that they are being overly dramatic, like when they don't get that last slice of pizza at dinner, but in this case it was a real thought that ran frantic circles around my brain. A young girl screamed for help -- then realized I was that young girl. My throat grew raw. I looked toward the lifeguards, but the stand was empty. Just then the ocean whispered, "Welcome back" as I was unceremoniously dragged out to sea. Maybe I'd just slip under the water and get it over with, I thought (no, not really, I swam like a lunatic and screamed for my life). It was then that I saw a lifeguard on a surfboard to my right. "Ok, climb on up," he calmly said as he paddled alongside me. "No, I'm ok, I'll just hang on," I spoke nonchalantly as if I didn't have a care in the world. At the same time my heart pounded so hard it wanted to leave my chest and jump on the board without me. Then I noticed that everyone (and I mean everyone) on the beach were on their feet staring at me. "Sorry," he repeated, "You have to climb up on the board."